Working at the crossroad of Europe and Asia for the past two decades, Chevalier is most known for her "Euro-Asian" art language born out of blending western media and elements of eastern art. 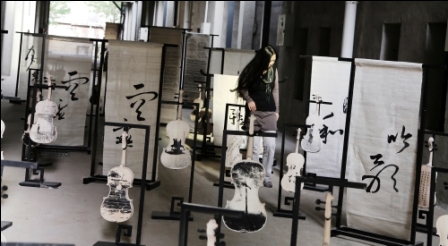 Four major r exhibitions of Li Chevalier have been successively presented by the C ontemporary Art Museum Rome ; National Art Museum of China ; Today Art Museum in Beijing ; Shanghai Art Museum ; State Opera China since 2007. Two of her major works became part of the French Embassy's art collection and are hanging presently at the reception salon of the French Residence in Beijing, next to the works of two other French Chinese born artists Zao Wuki, and Zhu Dequn. Her works are featured in many major international art fairs and exhibitions, such as Royal Academy of Arts London Summer exhibition, the Carrousel du Louvre (2003) the Grand Palais (2007,2011), London Art Fair (2007), Glasgow Art Fair (2008), Northern Art Fair (2008), Shanghai Art Fair (2008) etc. Former Peking Opera singer, soprano in the Paris Orchestra's Choir , li Chevalier has been collaborating with Paris Opera musicians since early 90s , showcased numerous musical -visual art associated event, particularly the < Visual Symphony> presented at the Stat Opera China, which echoed a violin concerto by China National Symphony Orchestra under the direction of Philippe Jordan.